TV is a library for composing tangible values ("TVs"), i.e., values that carry along external interfaces. In particular, TVs can be composed to create new TVs, and they can be directly executed with a friendly GUI, a process that reads and writes character streams, or many other kinds interfaces. Values and interfaces are combined for direct use, and separable for composition. This combination makes for software that is ready to use and ready to reuse. TV can be thought of as a simple functional formulation of the Model-View-Controller pattern. (My thanks to an anonymous ICFP referee for pointing out this connection.) The value part of a TV is the model, and the "interface" part, or "output" as it is called below, is the viewer. Outputs are built up compositionally from other outputs and from inputs (the controllers), as described below. Visit the Hackage page for library documentation. Install with cabal install TV. As of version 0.2, I have moved the GUI functionality out of TV and into a small new package GuiTV. I moved it out to eliminate the dependency of core TV on Phooey and hence on wxHaskell, as the latter can be difficult to install. The GUI examples below require GuiTV. GuiTV (better named "wxTV") is bit-rotten. There is also a very similar package to generate Gtk-based GUIs. I'd love to hear your comments at the Talk:TV page. The tv function combines an interface and a value. In this example, the interface is the default for string functions, wrapped with the title "reverse". TV "interfaces" are more than just GUIs. Here are two different renderings of reverseT. (User input is shown in italics in the runIO version). We'll see later that "runUI" and "runIO" are both type-specialized synonyms for a more general function. Just as an output is a way to deliver (or consume) a value, an "input" is a way to obtain (or produce) a value. For example, here are two inputs, each specifying an initial value and a value range, and each given a title. Now for the fun part. Let's combine the apples and bananas inputs and the total output to make a function-valued output. TVs, outputs, and inputs are not restricted to GUIs and IO. In general, they are parameterized by the mechanics of "transmitting values", i.e., delivering ("sinking") output and gathering ("sourcing") input. The "sources" will be applicative functors (AFs), and the "sinks" will be contravariant functors. In the examples above, we've used two different mechanisms, namely Phooey's UI AF and IO. The sinks are counterparts IU and OI. The functions runUI and runIO used in examples above are simply type-specialized synonyms for runTV. The examples reverseT and shoppingT above used not only the generic Output and Input operations, but also some operations that apply to AFs having a few methods for sourcing and sinking a few common types (strings, readables, showables, and booleans). The type constructors CInput, COutput, and CTV are universally quantified over sources and sinks having the required methods. type CInput a = forall src. type COutput a = forall src snk. type CTV a = forall src snk. So far, we done a little composition of interfaces and combined them with values to construct TVs. Now let's look at composition of TVs. The operator "->|" is part of a general approach to value composition from DeepArrow. While some interfaces can be implemented for different means of transmission, others are more specialized. 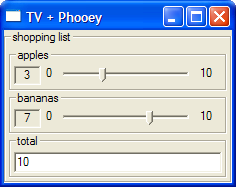 Here are inputs for our shopping example above that specifically work with Phooey's UI applicative functor. We can use IO operations in TV interfaces. The corresponding sink is OI, defined in TypeCompose. TV provides a few functions in its IO module, including a close counterpart to the standard interact function. Assuming we have a file "test.txt" containing some lines of text, we can use it to test string transformations. First, let's define higher-order functions that apply another function to the lines or on the words of a string. There are more examples in the TV repository and in the in the GuiTV repository. See also "separating IO from logic -- example". This page was last modified on 14 August 2013, at 15:39.